When making a map, you can plot locations by pinpoint on map, by entering latitude and longitude values directly, or you can create map even faster by import markers from a CSV data file, with a list of coordinates (longitude and latitude) values. Make an interactive store locator map in seconds. 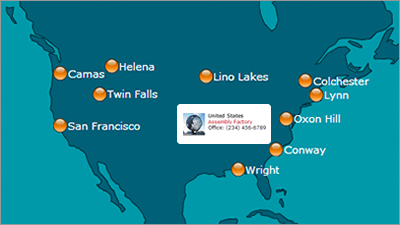 Show a map of all stores or branch offices on website to help customers find information. Users can click on a location to see details in a popup dialog boxes, showing address, phone number,etc, which supports text, links, images and video. 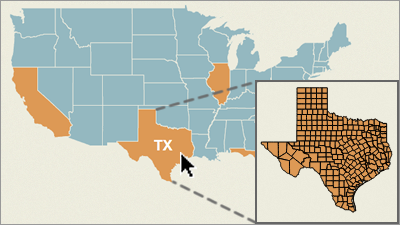 Create an interactive HTML5 map for presentation or data visualization with just a few clicks. Easily pinpoint locations, add routes, rollover and zoom effects. Embed your responsive map on website or share via email. Maps generated in HTML5, for viewing on PC, Mac, and mobile devices without plugins. Area Selector is an interactive map showing countries, states or counties. Users may click on an area and be redirected to a page related to the area, or continue with a search. 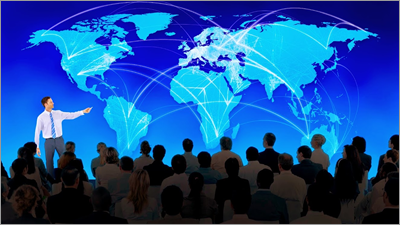 It is an useful tool for websites containing information related to multiple regions, e.g. a real estate website, an online hotel guide. Create a map with multiple locations and destinations. Connect locations by drawing lines or curves. Add labels, icons, push pins, with mouseover popup box to display detail information about the route. 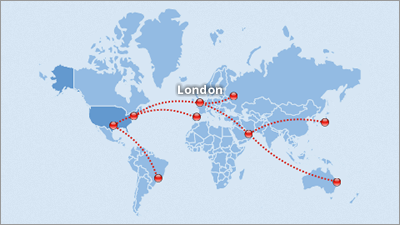 Quickly generate a travel map, shipping map, or flight route map. or try Online Map Editor with Google Maps available. Create a political map of the world with all the country names and borders, or a map showing the 50 States of US with their official abbreviations. Use color to visualize data in a better way. Highlight regions or generate heat map and bubble charts that shade geographic areas base on intensity. Create regional maps using ready made templates. Including world continents, countries, county maps of United States and zip code maps. Works on both 32/ 64 bit Windows. Maps are responsive and viewable on PC, Mac, mobile & tablets. Export for presentation or publish to website. 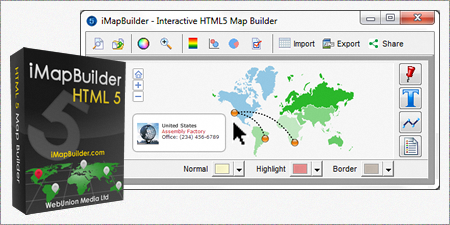 try iMapBuilder Online with HTML5 and Google Map support. Embed interactive map to a page or send direct links to share with others. Link to an image and video for every point of interest. 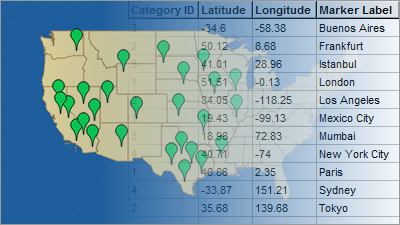 Edit location data using grids or import latitude/ longitude coordinates from Excel or CSV file. Use our default set of icons or import your icon images. Export map as an image for your documents, pdf or powerpoint.